Human growth hormone: The blood levels of growth hormone may increase as much as 5-fold. Higher levels of this hormone facilitate fat burning and muscle gain, and have numerous other benefits. Cellular repair: The body induces important cellular repair processes, such as removing waste material from cells. Lower insulin levels, an increase in metabolism, and higher growth hormone levels, are combined to use fat as an energy source. This occurs because you have no carbohydrates in your system to burn, so your body turns to the next available source of energy body fat. Increased autophagy may provide protection against several diseases, including cancer and Alzheimer’s disease. With so with so many benefits that have been attributed to intermittent fasting, it is worth researching. In fact I have not been able to find any research that indicates any negative effects. The only caution here is if you are someone with an unusually low percent of body fat or an anorexic. My advice is that unless you are doing this strictly as some form of dieting, make sure you are getting those calories in during your eating window. I personally like the 16 x 8 method versus a 24 hour fast. I’ve tried the 24 hour fast and while it is a great way to cleanse your body, it is much more difficult and in most cases you will be very hungry during those additional 8 hours of fasting that you have added on. To make the fasting period a bit easier you will need to consume some liquids like coffee, tea, or water. This helps by providing something in your stomach, making it easier to endure the fast. Do not consume liquids that contain calories, so no sugar in your coffee or tea and avoid any other liquid that contains sugar like soft drinks. The YouTube video below provides a great overview of the benefits and different types of intermittent fasting methods. I highly recommend you spend the 10 minutes to view this as part of your own research. I personally don’t view intermittent fasting as a diet, but more of a way of enhancing your health. It is entirely possible that you will not lose any weight at all if you continue to have an unhealthy diet, but if you combine intermittent fasting with a healthy diet there is a good chance that you will lose fat and improve your body composition. Do your own research, and let me know what you think. We find too many people that view various forms of exercise as something they should do to lose weight or look better, which is fine, but there are many of us who view it as a hobby. When exercise becomes a hobby you no longer dread your workouts in fact you often think of them, looking forward to them. Developing a perspective that you are not exercising to achieve some goal, but instead it is a form of pleasure, provides you with a long term outlook. If I exercise to lose 10 pounds, what happens when I shed the 10 pounds? Maybe I will stop exercising because I have achieved my goal, but if the weight loss was just one of the results of enjoying my hobby, I am more likely to keep pursuing my hobby. consistency becomes habit and habits can be pleasurable. Being resolute in the beginning is one of the keys. results tend to provide encouragement, you begin to think this is providing positive benefits for me, and this makes me want to keep doing it. endorphin’s are released when exercising, providing pleasurable feelings and reducing pain in the body, yet another reason that helps you shift from I have to do this to I want to do this. In fact the mind shift becomes cemented when you find that you don’t feel good unless you have exercised that day. As you begin to see results, and you realize all the benefits you are getting from exercising, it becomes a habit and as many of us can attest almost an addiction. Don’t be surprised if you go away on vacation and decide you just can’t sit there on the beach, pretty soon your taking a run or walk, and maybe spending some time in the resorts gym. This mind shift begins with consistently performing the activity, and it will become a high priority habit in your life. That habit will grow into a pleasurable hobby that you look forward to and yes reap all the benefits that come with it. When I moved to Texas about 3 years ago I left my squat rack in Michigan, along with a lot of my weights. I spent a lot of time doing squats with no weights except for my body weight, and while this maintained my quads, hamstrings, and glutes I was looking for ways to add resistance. I tried dumbbell squats and they are at best awkward, so I abandoned that idea. I don’t have room for another squat rack in my game room upstairs so I did a little searching and found this thing called a Hex Bar. I looked into what you could do with this bar and found that it really is good for two exercises, including a squat/dead-lift and shrugs. The two pictures below give you an idea of what the bar and the squat/dead-lift look like in action. I found that the squatting exercise is really a combination of squatting and doing a conventional dead-lift. The bar itself weighs 50 pounds so even if you only load it up with a couple 25 pound Olympic plates you have 100 pounds of resistance to work with. One of the things I like about this type of bar is that you can put a lot of weight on it and you don’t need to lift it over your head like a conventional barbell. It is also a great space saver for those of us with limited room for equipment. Does it work? In my experience it worked my quads, hamstrings, glutes, and lower back to some degree. I noticed that my legs and glutes were pretty sore for a couple days following a workout with the Hex Bar, so yes it really works. In the past I have talked about the need for progressive resistance so that you are overloading muscles to make them adapt to the heavier loads or more repetitions. This works for a while but unfortunately your body becomes accustomed to doing the same exercises, and of course your own capacity for effort can be limited along with your ability to recover. Don’t get me wrong I am not advocating that you opt out of the progressive resistance camp, but you might consider a couple tweaks to get your body to react by building larger muscles and gaining strength. Here are a couple of tweaks that can help put you get back on track, making those muscles adapt and avoid plateauing. During my chest and triceps routine I was resting about 2 1/2 minutes between sets and while this allowed me to do one set after another of push-ups, in some ways it made it too easy. Without even adding any reps I took the rest time down to 2 minutes between chest exercise sets and 1 1/2 minutes for triceps exercises. I know this doesn’t sound like much, but it made it more difficult to do the sets with less rest. So without adding weights or repetitions the intensity was increased simply by reducing the rest time. On alternate weeks perform this routine. Hopefully by limiting the rest between sets and using a bit of muscle confusion by alternating routines you can spur on continued growth, making your workouts more difficult and at the same time a bit more interesting. In addition to these tweaks make sure you are using the principles of progressive resistance to add sets, repetitions, and weight. I would love to hear about any tweaks you use to increase muscle adaptation or make your workouts more fun. My workouts are a little shorter and less exhausting because I am focused on one or two muscle groups. This makes it all more enjoyable instead of looking at a long list of exercises and wondering when it will all be over. With the 3 or 4 day split I had to cut out some sets, but with the 5 day split I can keep adding reps and sets so I am able to do more work and put more stress on the muscles. A harder workout means faster gains in strength and size. It fits well with the work week, so every night when I get home I can look forward to a workout, keeping me focused on fitness and away from other less healthy activities such as eating or drinking. The only negative with the 5 day split is that it consumes 5 of the 7 days in a week, and if something else comes up you can potentially miss a workout. Remember you don’t need to perform the split Monday through Friday, it is more than feasible to just perform the workout starting on whatever day of the week. It is advisable to give yourself a rest day after completing the 5th day of the split routine, because even though you have divided up the muscle groups others still participate in an assisting role. I like to keep track of my workouts with a Google sheet (spreadsheet), so that I can record the date of the workout, weight, target reps, actual reps, and any notes for adding reps or sets next time. If you are currently doing total body workouts or shorter split routines, try the 5 days split and enjoy the gains you will make. Who knows you might just look forward to your workouts. None of these workouts exceed 60 minutes and most can be done in 30 – 45 minutes. This is a big advantage of a 5 day split over lesser day routines, allowing you to focus on fewer body parts and really turn up the intensity while keeping the workouts relatively short. So next time you consider adding just a little more to your routine, think about a 5 day split. For ways to increase the intensity of your workouts refer to one of my earlier posts Just What is Progressive Resistance? Balancing poses are an important part of a yoga practice and have many benefits. One of the primary benefits of a balancing pose is as its name implies it allows you to work on your ability to balance your body weight by improving your coordination and strength. In my daily yoga practice I perform three asanas that I find helpful in maintaining and improving my balance, and that I just enjoy doing. Stand in Mountain Pose. Inhale, shift your weight onto your right foot, and lift your left heel toward your left buttock as you bend the knee. Press the head of your right thigh bone back, deep into the hip joint, and pull the knee cap up to keep the standing leg straight and strong. Then repeat but this time, inhale and shift your weight onto your left foot. 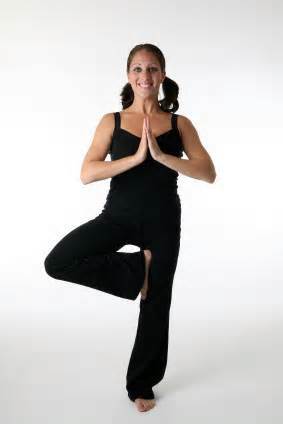 Another of my favorite balancing poses is Tree Pose. I’m only going to show what would be considered the intermediate version of Tree Pose or what is the most typical at least from my experience. Stand in Mountain Pose, draw your right foot up and place the sole against the inner left thigh; if possible, press the right heel into the inner left groin, toes pointing toward the floor. I like to put my hands together as depicted below, but you can extend your arms over your head either hands touching or apart. Stay for 30 seconds to 1 minute. Step back to Mountain Pose with an exhalation and repeat for the same length of time with the legs reversed. The third balancing pose is called Warrior III. This pose is great for building strength and balance. Unlike the first two it gets your back perpedicular to the floor. With one leg in front of the other bring your weight forward into your front foot and gently kick up your back leg. At the same time, bring the torso forward until it is parallel to the floor. Keep the neck relaxed, as if it’s the natural extension of the spine. You can either bring the arms back along your sides or bring them together in front of you as depicted below. Use these balancing poses to help calm yourself and work on your coordination, balance, and strength. They will help you acquire the strength and balance you need to protect yourself and prevent falls and other mishaps that happen out there in the world. For me they are more calming in nature than most of the other standing poses and provide a nice transition to supine or sitting poses. Remember the key to maintaining your balance is to pick a focal point in front of you with your eyes and focus on it allowing your body to naturally balance itself.